The White Star Line's Olympic is generally referred to as the sunken Titanic's sister ship. As such, she generally rates a chapter in Titanic or liner books, but rarely her own book. The first person to recognize that she deserved more was Mark Chirnside, who authored the book, 'RMS Olympic, Titanic's Sister'. Then Wade Sisson focused on Olympic's role in the Titanic disaster in, 'Racing Through the Night'. Now, we have the beautiful pictorial history, 'RMS Olympic', by noted maritime memorabilia dealer and researcher, Brian Hawley. An inviting cover by Robert Lloyd signals to the reader that this will be a 'wow' book. As I looked at the sharp photographs that have mostly never been seen before, all I could say was, 'wow'. The generous size of the photos lying in dock or cruising through the waves makes you think you can reach out and touch the Olympic. Well-researched anecdotes accompany each photo to provide interesting details that maybe new to the reader. Did you know the bridge wing was originally flush with the side of the ship, until a suggestion was made, possibly by Captain Smith, to provide better visibility for the officers by extending the wings over the sides? Interior shots taken as the ship was being fitted, in service and as the ship was being dismantled show the gradual changes to keep up with the styles of the times. A rare shot shows the instructions on how to put on a lifejacket. Original sketches show the exact designs of her camouflage during World War One. Another treat is a color deck plan along with colorized interiors such as the second class dining room and third class smoking room. Students of ocean liners will be encouraged to learn more and researchers will regard this is a great source of new information. 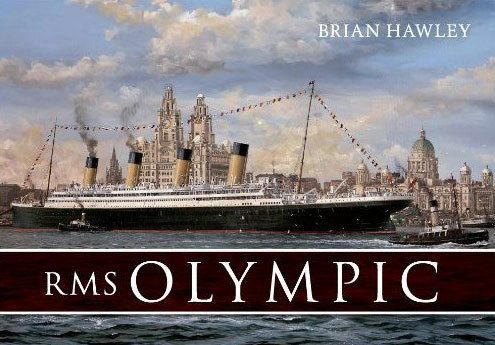 To my knowledge, there have only been two other substantive books about the history of the Olympic: Simon Mills' RMS OIympic: The Old Reliable from 1995 and Mark Chirnside's seminal work "RMS Olympic: Titanic's Sister from 2004. Brian Hawley's new book, simply titled RMS Olympic is therefore a very welcome addition to the Olympic historiography and its publication was eagerly awaited among ocean liner enthusiasts but has the potential to open up the subject of the beautiful ship and her remarkable story to a new and wider audience. The book is essentially a collection of photographs, many of which have previously been unpublished and are now most fortuitously included in Hawley’s work. Over its 126 pages, we possibly have a more vivid portrayal of what it was like on board the Olympic and changes to her interior over the years than we have had before. The chapters cover her building, her early years, her ‘glorious’ interiors; he ‘disguised’ war years’, her ‘noble’ years in the ‘20s and ‘30s and the end of the line in 1935. There are a few pages of narrative history, describing significant happenings the Olympic's career such as the collision with HMS Hawke and a detailed description of the business woes of the White Star Line. Otherwise, the majority of the book tells the story of the Olympic through pictures and their associated captions. The pictures in this book are hugely impressive. Starting with a beautiful painting by Robert Lloyd of the "ship magnificent” at Liverpool at the beginning of her service life in 1911, the pictures include previously unpublished photos of her fitting out, her wartime dazzle paint scheme and of her stripping out in 1935 in preparation for her scrapping. The book concludes with a gem of an appendix containing the hitherto unseen photos taken in New York in 1912 for the US Titanic inquiry. These photographs bring a wealth of learning to readers and in a format that is easily and quickly read. While the photographs Brian Hawley has collated from dozens of collectors around the world are the most striking aspect of his book, there were a few editorial issues I was struck by. The photographs within the chapters do not appear to be arranged in any strict order and sometimes the captions do not relate to the photos they are attached to. One example is the first picture of the Olympic at the Canadian port of Halifax during the war, the caption is devoted to describing the White Star Line’s link to the British admiralty since 1889 which left me questioning the relevance of the caption to the photo. Nonetheless, a few pages later we are told of the human story of Olympic’s close association with Halifax because of the tens of thousands of Canadian troops she transported to and from the trenches of the first world war. While the information about the history of the White Star Line is indeed valuable and interesting, I feel it would have been better consolidated into a single section and the photograph captions freed up to more fully describe the remarkable images Hawley has obtained. It would also allow more space to fill in gaps in the Olympic’s history which while they have been admirably covered to some degree, gaps in time and detail are evident as you go from one photo to the next. For example, while a series photos give detailed information about the dramatic post-Titanic events of 1912, turn the page and the extensive refit of 1913 that considerably altered the ship’s appearance and internal structure is presented as a fait accompli. Nonetheless, the reader is treated to some other detail of the famous passengers that travelled aboard Olympic during her highly successful career, including US President Herbert Hoover, Waldorf Astor and Gertrude Vanderbilt. There is also great detail about the silver service and kitchenware provided by Royal Crown Derby and some rare and very sad photographs of Olympic’s famous public rooms during her stripping our that have been published in magazines and pamphlets before but this is the first time I have seen them in a book. As ‘a true fan of Olympic’ as Brian accurately dedicated my copy of his book, I must say that I thoroughly enjoyed reading this exciting new book from cover to cover and it now takes pride of place on my book shelf. I will certainly enjoy dipping into it for reference in the years to come as its format makes it easy for casual reference. You don’t have to be a die hard ocean liner enthusiast to appreciate the learning about the beauty and outstanding success of the Titanic’s lucky sister ship. If you have a passing interest in historic ships, the glamour of the gilded and jazz ages, the tragedy of the Titanic, art history, interior design, world war one, the great depression, old New York City, Belfast shipbuilding or even antique cutlery and bone china, you must read this wonderfully succinct and compact book that provides the reader with an excellent introduction to RMS Olympic in her own right and not under the shadow of her unfortunate sister ship.